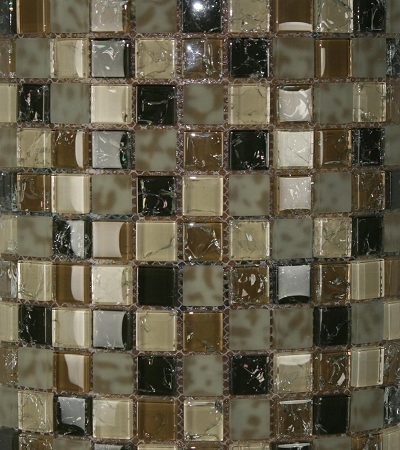 Pacific Dunes Blend Crackled Mosaic would be a beautiful and elegant addition to any home or office. With mesmerizing crackled pieces that offer an alluring quality to the mosaic, you won’t be able to take your eyes off it. Small square tiles create a gripping pattern of crackled gold and black glass pieces with soft cream pieces surrounding them. Throughout the piece there are off-white colored tiles with soft, hazy brown spots that give the mosaic an element of movement. Creating an elegant, yet warm, space is easily done with Pacific Dunes Blend Crackled Glass Mosaic. Pacific Dunes Blend Mosaic is ideal for areas with some traffic because the colors are painted on the back of the glass pieces to ensure the colors will not hip away. On mesh backings, Pacific Dunes Blend Mosaic is ideal for easy installations. 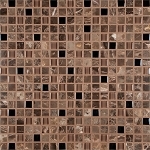 Pacific dunes Blend Mosaic is ideal for interior setting for residential or commercial use. Whether as a kitchen backsplash, bathroom border or accent in any room, Pacific Dunes Blend Mosaic is the perfect addition to your next build or remodel.